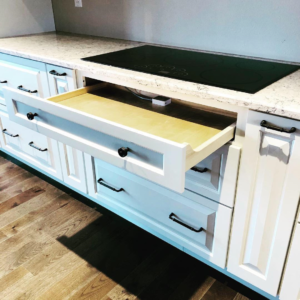 Whether you are remodeling or building a new home, storage and organization solutions tend to be the number one request when it comes to designing our client’s kitchens. 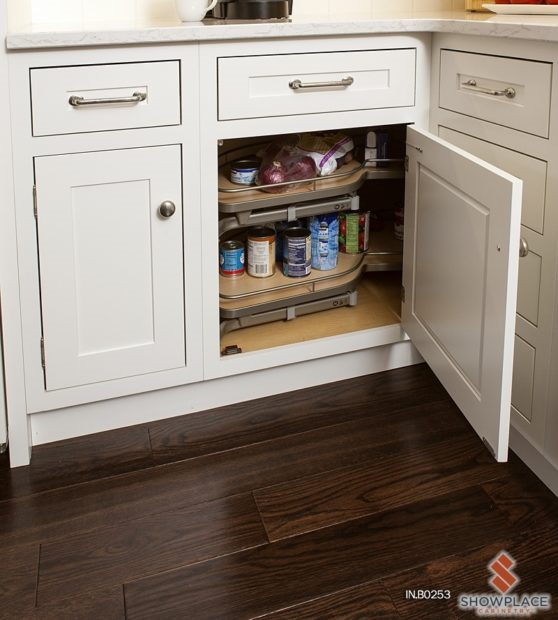 More often than not, when we show our storage solutions to our clients, they gasp and say “I didn’t know that was even possible for my kitchen!”. 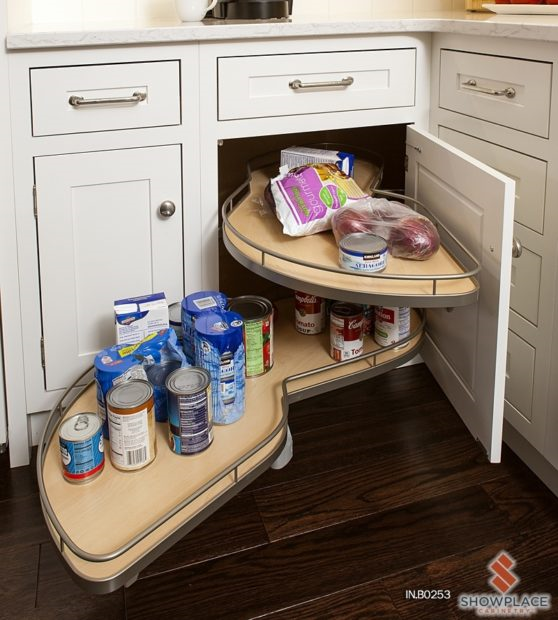 Below are a few examples of our favorite kitchen storage and organization solutions chosen specifically by our designers here at The Design Studio! Pull out spice drawer. 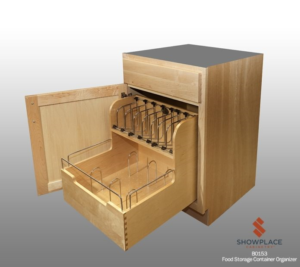 This essential component not only keeps your cooking spices organized but it also a space saver! 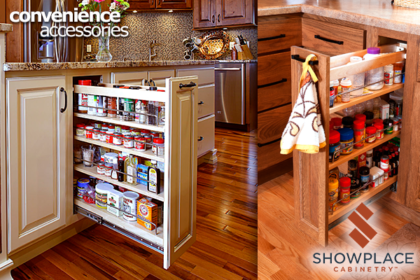 This functional component for your kitchen will give you the best view possible for all of your spices! PRO TIP: this can also double as additional storage in tight spaces. For example, put this next to your sink and put your cleaning supplies in it! Two-tiered cutlery divider drawer. 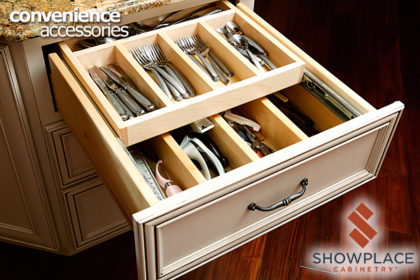 This handy drawer allows you to maximize your storage AND organization for all of your eating and cooking utensils. PRO TIP: us ladies love these in the bathroom vanity for make-up organization! Tupperware/pots and pans storage. I don’t know anyone who hasn’t lost a lid to their Tupperware. Or, you’re more like me and fight with constantly shuffling through pot/pan lids until you find the right one. Well, our Tupperware/pots and pans storage organizer is the perfect solution. It comes with adjustable components to fit almost any configuration you need! These are the most versatile organization solutions on the market today! Scoop Drawer. 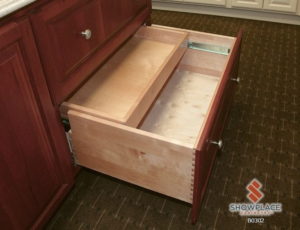 This newly engineered drawer was created specifically to add storage underneath your cooktop in your countertop. With drawer storage in kitchens becoming highly requested, the scooped part of the drawer allows clearance for the cooktop unit itself. We find this to be a great place for cooking utensils! Deluxe Blind corner. Sometimes our clients have had a base cabinet in the corner with the storage in the back that is almost impossible to reach. (see example below). 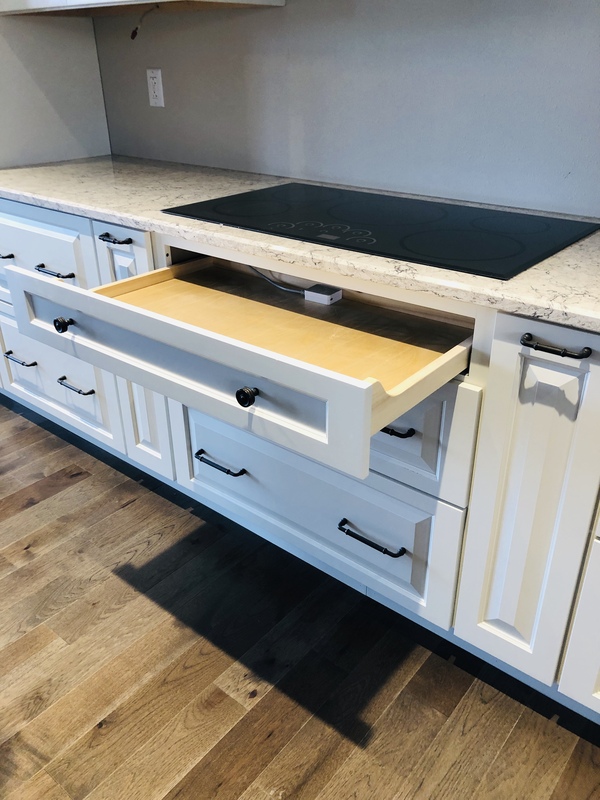 While these may have been a great storage solution in the past for smaller kitchens, now cabinetry lines have come up with an incredibly well-engineered option to help our clients reach the items in the back of these cabinets. The photo speaks for itself! Previous Previous post: What flooring is right for you?